"You have a story for everything!" said my schoolmate after I finished telling her the tale behind something I was wearing. I can't remember if it was a piece of jewellery or an item of clothing, but I do remember her comment made me laugh and then pause to acknowledge its truthfulness. "Yes, I suppose I do," I said. Even now, many of the objects in my home have a little history, a connection to some small though memorable event, and when I use them my mind will drift back to the time and place when I acquired them. I remember going into the local Community Services Thrift Shop a few years ago and buying two china cups and saucers, one in pink and one in blue, for my daughters. I think they were five dollars each. The volunteer at the counter that day remarked on my desire to collect old things. She told me her daughter did not want to inherit any of her mother's china or furniture, and preferred everything brand new and to her own taste. She found that sad, and so did I. But then, I am a collector. It was my mother who taught me the phrase 'Waste not, want not.' She often brought home useful things unwanted by others (and still does!) when I was a child. She is also an historian and archivist and likes objects rich in history and family connection. 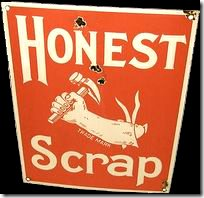 Much of our home was furnished with second-hand items and inherited objects from the homes of my grandparents. I cannot truthfully say that my home is made up of the same; we are outfitted with IKEA pine mainly, and have yet to reach the stage (thankfully) of inheritances - though I do have a few special things from my deceased grandparents. I have added to these treasures 'finds' from the thrift stores of the various communities in which we have lived. Not being of the budget to frequent antique shops, I rely on my fairly good eye and my 'Spidey senses' to lead me to hidden treasures in the thrift shops. Over the years I have been very lucky. I have a special fondness for vintage dishes and books, but I also keep my eyes open for kitchen items, wool sweaters, and paintings. Many of the ladies at the local thrift shop know me well. I go there once a week when time permits, I generally walk or ride my bike, carrying my green backpack. One elderly lady, who no longer works there apparently took note of my taste in dishes. One day, when I had only four dollars in my wallet, (they take only cash) I visited the shop when she was working. She quietly called me over and said, "A nice Wedgewood cream and sugar set came in and so I put it aside for you." She then took it out and placed it on the counter. I did like it, and tentatively asked how much it was. "Would four dollars be fair? It is Wedgewood." I thought it would be fair and emptied my wallet. The pitcher pours perfectly - no drips at all. I date these from the 1960's. ﻿ Another time I found a wonderful Sadler teapot, which also pours perfectly, unlike my old one, for two dollars. As I lined up to pay for it, the woman behind me said, "You are walking out with the best deal in here today!" I liked the teapot because it was just so gloriously 1980's in its graphic black and white colouring and shape. My son took an immediately liking to it and wants to inherit it. It is rather masculine in style. This pitcher I found at the shop one day, and when I looked it up on the internet I was thrilled to find that it was worth over ten times what I paid for it. However, I would have loved it it any case. It was made by California's Vernon Kilns and is from Don Blanding's 'Honolulu' series. To me, the pitcher just shouts 1930's and the golden age of Hollywood. I felt very lucky to find it. Apparently the series was discontinued in 1939. I have four active children, and dishes get broken from time to time. A few of my treasures have been broken over the years, which is always very sad but not devastating as I've rarely paid more than five dollars for them and they have no family history. Besides it gives me an excuse to keep the treasure hunt going. I do have a deal with my husband, though. To keep the house from becoming completely cluttered with my findings, I have to purge every once in a while. It is fair to say we regularly donate as much as we buy from the thrift shop. By far, the rarest find in the thrift shop is an original drawing or painting to my taste. That is not to say the shop isn't filled with framed pictures of all kinds, I just rarely like any of them. This week I lucked out, however. After spending the morning working away at various projects I decided to go for a walk in the rare winter sunshine. I had not been to the thrift shop for a few weeks and as it is at least a half mile from my house I thought it a good destination. I threw on my backpack and ventured out. Wandering around the shop, visiting the kitchenware room first, then making my way to the back to look at the books and pictures I found, on the floor, leaning against another dusty picture, an oil painting. I picked it up, studied it, put it back down and walked a few paces away to see how it looked from there. I took it up to the counter and inquired as to the price. "Four dollars, all pictures are four dollars today," said Rosie the shop manager. I decided I liked the painting too much to leave it in the shop, but to walk home with it would be cumbersome. I was considering whether to ask if they would keep it for me until I could bring my car, when my neighbours who were also in the shop, offered to give me a ride home with my painting. That in itself was very kind, but the fact that their automobile is a huge diesel monster truck with 'Git 'r done' emblazoned across the back window makes my tale that much more amusing. We walked out with our goods to the parking lot. I went around to the side of the truck. My neighbour pushed a button and a step unfolded from under the door. The back seat was at the level of my head and so I hoisted myself up using the step and placed my painting on the leather seat beside me. My painting and I were carried in style to the tune of 10 miles to the gallon, amid a discussion of what the truck was used for (Search and Rescue missions and hauling their travel trailer). When I was dropped off at my door I thanked my kind neighbours profusely for the ride home. The step was unfolded once again, except this time my foot slipped a little on it and I sort of slid unceremoniously out of the truck to the ground far below. I hung up my new, four dollar painting straight away. I loved how my eye was drawn around past the headland to the sunlit hill beyond. It made me think of the book Swallows and Amazons by Arthur Ransome. I have no idea who the artist is - a P or D Newton - or where in the world he/she was when he/she painted it, and although I am curious to know the painting's story, I'm still rather preoccupied with my own story - about how I brought it home. The first time I was exposed to Yoga, at eighteen, I didn't even know it. I was taking a week long modern dance workshop with the wonderful instructor Diane Black from Los Angeles and having the best time! Diane was like a tiny, smiling, jet black-haired sparkplug, was incredibly encouraging and in tune with the core elements that can bring out the dancer in everyone. In essence, a truly gifted teacher. At the beginning of each class she had us lie down on our backs, stretch out our legs and raise our arms above our heads. Grabbing the left wrist with the right hand she had us stretch toward the right and breathe into our left sides, then she repeated the same on the other side. It was a foreign concept to 'breathe into' some part of the anatomy other than the nose or mouth, but I used my imagination and tried it. Diane had us go through a number of similar exercises all the while breathing deeply into various parts of our bodies. By the time we stood up ready to dance we were thoroughly warmed up, in perfect balance and aware of and alive to every part of our bodies. I had never felt that way before when dancing and it made everything better. I was more alert, my reactions to instructions were quicker than ever before, my body more limber and strong, or at least so it seemed to me, and thus my confidence rose in my own ability to express myself through the various movements. Three years ago, when I started attending yoga classes instructed by my friend Mike I recognized many of the same poses and breathing exercises from Diane Black's classes twenty-odd years before, and I was immediately hooked. Mike holds drop-in yoga classes in two locations in my town, in a multipurpose studio in the Fitness Center and in the viewing lounge of the riding stables where my eldest daughter rides and works with horses. I prefer the large, airy room which overlooks the riding arena because it's quiet even when people are riding below, the lighting is adjustable and warm, and there is plenty of room for everyone to spread their yoga mats on the wood floor and stretch out. The room at the Fitness Center is okay too, apart from the concrete floor and harsh lighting - though Mike usually turns off the flourescents and lights candles instead - but it can also feel a bit cramped if a lot of people show up. All of us were now up, adjusting our various versions of the lotus position, and ready to chant our three 'ohms' - apart from Richard, the dairy farmer. He had fallen fast asleep. "Richard! Wake up!" hissed Joe, the Swiss chef who occupied the mat just in front of him. Richard got up and in a bit of a daze said, "That tractor put me right to sleep. There's no more relaxing sound in the world!" Spoken like a true farmer. Recently I heard an interview with a Vancouver yoga instructor. He was offering classes with heavy metal music playing. He said the concept was to train people to learn to block out all noise and distraction, the idea being that if they could meditate to heavy metal or other distracting noise, they could do yoga and meditate anywhere and in every situation. I suppose there is a certain wisdom to that theory...it obviously works for Richard. There is also something called Laughter Yoga. I got a taste of that last night...and I think it works for me...on occasion. The pose pictured above is the single leg raised wheel pose. Fitting, for tractor yoga don't you think? 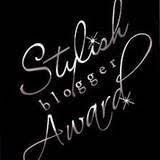 I also want to thank Kate for the Stylish Blogger Award (at right). I am honoured and cheered by it! 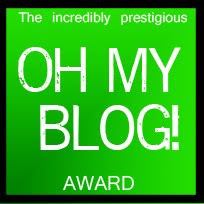 I will pass it on to seven worthy recipients in my next post. It is a well known fact that the rise and fall of civilizations can be tracked in their art and architecture. I learned about this in my art history courses in University and found it utterly fascinating. The wealthier and more powerful a civilization became the more decorative and ornate its art and architecture and the more trampled upon became its lower classes. Think European rococo architecture with its elaborate ornamentation in the 18th century and the subsequent French Revolution. Think the Roman Empire with its coliseums and palaces and its equally famous decline and fall. And there exist countless examples amongst the Central and South American civilizations as well. I have heard grumblings recently in the media and other places about our place as a civilization in terms of the aforementioned lifespan. We in the western world and to some degree those in parts of the east exist in a somewhat blinding swirl of excess. Everywhere we turn there are examples of bigger, more, higher, faster, stronger, fancier, busier, richer, but chewed up and spat out from that swirl are equally noticable examples of the lesser, smaller, slower, weaker, disenfranchised, disillusioned, poorer and more desperately in debt. The phrase, "Something's gotta give" springs to mind. While I wouldn't say this excess is necessarily expressed in our art - I don't know enough about the present art world, it is expressed in our architecture: endless luxury highrises, big box stores and mega-casinos, and in our technology and design: cellphones that do everything but tie our shoes for us (although I am sure there is a app for that), personal hot drink machines which read the barcode of each single serving plastic 'pod' and concoct the perfect cappucino for us, and endless disposable cleaning products with the catchy phrase: 'just use, and toss!' (without a thought for the landfill). I fear that this swirl of excess is causing our society to lose our footing and our perspective. Last week I delivered a letter to my municipal council expressing my concern about the amending of a bylaw which would allow the opening of another liquor store in our community. While I used the fact of the well known local problems with addictions in our community and the drawing away of business from the several other liquor outlets, not to mention the downtown core in the area, to support my argument, in my heart of hearts I knew that my objections to the new business mainly stemmed from my sometimes puritanical aversion to excess, ie: did we NEED another liquor store? No. I feel exactly the same way about the brand new Walmart Supercenter in the nearby mid-sized city. There are already several large grocery and department stores serving the city, with some of them Canadian owned with good reputations for treating their employees well. It's not like any of these large stores have ridiculously long lineups at any time but Christmas and summer long weekends. Did the area need yet another supermarket/department store to serve the population? Absolutely not. But people will shop at the new Walmart because they are convinced the prices are lower - at what cost, though? Their produce is often overpackaged as if it were something other than food and trucked in from faraway lands, and their clothing line cheaply made in sweatshops. I know senior citizens and sleep-deprived moms might appreciate the one-stop shopping of a Walmart Supercenter, so I will concede on that point if I must, but I would argue that our Canadian Superstore offers almost all the same products and services with more of an emphasis on groceries. Furthermore, many people I know will forgo the Walmart entirely in favour of driving even further west to the nearest Costco, where a membership for the privilege of shopping there will cost fifty dollars. Costco shoppers are a dedicated lot. They buy their clothing, televisions, computers, bulk-sized food products, furniture, garden supplies, all at Costco. Once on the way back from an event in Abbotsford, the friend I carpooled with, a Costco member, stopped there to pick up a few things. I had not been in a Costco for many years. My thought was immediate: if I owned a restaurant I might want to shop here, for everything was in huge quantities, but for my family of six? It would be too easy for me to lose perspective. Years ago my eldest sister once warned me against the buying of groceries is such large quantities. 'The more you buy, the more you'll eat', and it is true! When I bought the 2 kilogram bag of tortilla chips and the 2 litre jug of salsa, I ate much more of it than was good for me. Everywhere I looked in Costco there were triple sized boxes of everything from cereal to diapers. I felt like I was in the Land of the Giants. I half expected to see Hagrid come around the corner with a triple package of chicken legs to feed his pet dragon. For a nation of overeaters, these supercenters do little to help, though for the truly organized and disciplined I suppose the value can be good for the money, even with the extra fuel needed to get there (?). People will argue with me that it is all about choice, not consumptiveness. I agree, some choice is good and democratic, but too much is just confusing and wasteful. One only needs to go in a liquidation store to see what happens with all the junk nobody needed to buy when it was first new. The number of large second hand stores such as Value Village also reflects the amount of cheap quality throw-away clothing that is produced in the world. While some people must routinely clear out their accumulation of clutter, still others have psychological problems which cause them to buy and hoard stuff until their homes are bursting at the roof joints. I don't want to come across as hypocritical, because I am a dedicated buyer of second hand books, vintage dishes and clothing, so I benefit from other's purchasing and am just as guilty as many other people purely by association and habit. My objection is not to people having what they have and enjoying it, it is against buying what we truly do not need for happiness or survival and placing too little value on quality versus quantity. I am not about to join my voice to the doomsday club, I have great hopes for society as more and more people are choosing to live in humbler dwellings, grow their own food, walk or take public transit, etc., but with the rumour of forty more Walmart Supercenters going up in Canada, there is cause for concern and activism. Globally, I am afraid, unless something happens to stop it, we will continue to be the giants, greedily stuffing our faces and plundering the earth to fill our coffers while stomping on or ignoring the 'little people' down below while they only ask for a dignified way to carry on living. We shouldn't be surprised when little Jack and his magic beanstalk infiltrate our cozy swirl and run away with the goose that lays the golden eggs. It might even be good for us in the long run. When I was looking for an image for this post I found the one above - the ad for an actual television show from long ago called The Land of the Giants - so I used it. to be a good, peaceful one for him. Let's hope so! Celebrating the Lunar New Year is a big deal in this part of the world. Vancouver has had a healthy Asian, and particularly Chinese, population from the beginning of its days as a city. 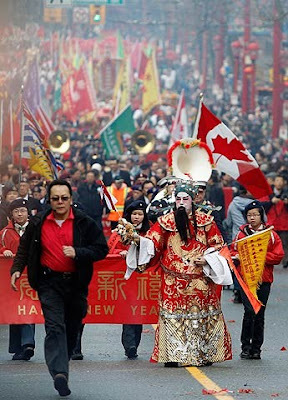 Immigration has remained steady over the past one hundred years and the Chinese and related cultures have grown to make up a large percentage of the population here in the Lower Mainland. When I was a student at the University of British Columbia in Vancouver, forty percent of my fellow students were of Asian descent and I believe that number is even higher now. In cities like Richmond, just outside Vancouver, whole shopping centres are Asian in theme and content, and several of the public gardens are beautifully and decidedly Asian in design. CBC Vancouver morning radio is occupied with Chinese New Year these days, as well. The descriptions of special dishes and family gatherings are reminiscent of Christmas and my mouth waters to hear of Wonton soup and shrimp salad rolls - a delicious snack I enjoyed often at the UBC Arts lounge. The end of January is a good time to start looking forward to something. The weather, especially last week, was particularly gloomy here - the rain came down relentlessly and the damp invaded my bones. Some friends of ours, not in the least Chinese themselves, nevertheless put on a Chinese New Year party every year as a way of cheering everyone up. We are all expected to arrive with some indication in our appearance of the animal that is our birth year's sign. I am a rooster, but since I don't own anything roosterish to wear I figured it would be acceptable enough to arrive dressed in New Year colours of red and gold. It wasn't. Before long, my friend Sue, the hostess, found a rooster figurine (a salt shaker actually), threaded it with a piece of red ribbon and hung it around my neck. I'm really going to have to look for some rooster earrings or a scarf for next year! Believe it or not, most people were good sports and arrived with tiger tails, rat ears, piggy masks, or dragon shirts. The party was a supper pot-luck and most of the dishes were Asian in origin, so we enjoyed plenty of spicy coconut based dishes, rice and vegetables. (The desserts were decidedly North American, though.) We all had to sign in with the 'front office staff' of the party - my youngest daughter and her friend - under our respective animal signs, and then we were photographed with our fellow roosters, dogs, sheep etc. A good time was had by all and the effect was the one desired: we were certainly cheered up! Growing up in caucasian-filled eastern British Columbia, Chinese New Year was not something I knew anything about, but the college I attended had an English as a Second Language department (for which I tutored throughout the year and then worked for as a teacher assistant one summer) and welcomed mainly Chinese speaking students from Hong Kong as well as several Japanese young people. The department celebrated the Lunar New Year and hosted various events throughout the college and so my friends and I were introduced to the traditions. When I worked for the department we went for traditional Chinese New Year supper at a restaurant near the college. It was the first and only time I ever attempted to eat duck served with the head and feet intact. 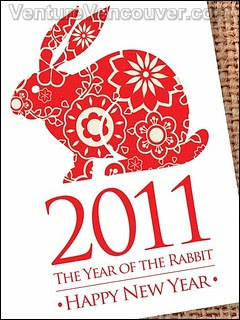 The other day I was shopping for a gift for a friend whose birthday happens to fall on Chinese New Year and noticed that Purdy's chocolate shop (founded in Vancouver in 1907) had a display of 'Year of the Rabbit' chocolate medallions and 'Good Luck' chocolate coins wrapped in red and gold paper. The rest of the shop was filled with the reds and pinks of the upcoming Valentine's Day wrappings. The girl at the counter told me she was tired of red (the shop had been filled with red since well before Christmas) and couldn't wait for the pastel-coloured wrappings of Easter, which will, no doubt, be the overwhelming theme in the shops come February 15th (bunnies and eggs are already making an appearance in the grocery stores). When Easter is over, Purdy's will go back to their usual regal purple and gold wrappings with a few apple themed teacher gifts thrown in for the end of the school year. As I get older, the holidays seem to follow each other in increasingly rapid succession in the commercial world, providing more reasons for Lindt or Purdy's to cash in appearing all the time. While I don't really take ownership of something like Chinese New Year - as my Polish friend Agnieszka would say, "I didn't grow up vis it" - I certainly don't mind piggybacking onto the celebrations for the sake of breaking up the late winter doldrums. The wait for one of the most important holidays in my life, Easter, which isn't until April 24th this year, will be long enough. Besides, acknowledging the importance of the Lunar New Year to our Asian-Canadian neighbours is just good manners, right? Party on! The photo at right is from the Toronto Sun's website.